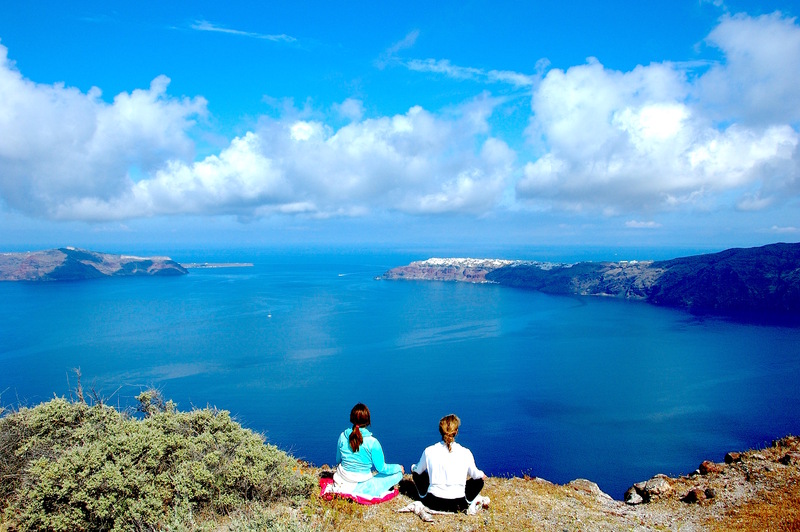 Yoga In Greece > YOGA IN SANTORINI! Doing yoga in Santorini and feeling the volcanic energy of the island with 7000 years recorded history is an unparalleled experience! Everything is unique in this place and so is the effect of Yoga, Qigong, Meditation & Relaxation. Practicing Asanas and Pranayamas or cultivating the chi energy of Chi Kung (Qigong) overlooking the volcano is an exceptional experience. Meditating as the sun sets at the outskirts of the caldera accompanied by the sound of flute mends all parts together as we experience the unity within. Feel the glory of nature in the majestic land of Santorini… Visit two distinct ancient sites (1800 BC & 800 BC)… Taste unique local wine & food… Visit old wine cellars (canavas)… Walk along the caldera and see its red, white and black rocks…Experience unfathomable views up to Crete which can be seen in its entirety on a clear day…You can also charter a boat to see the sunset from the sea. You may come for 2, 3 or 4 nights. No one is the same after Santorini. This is a journey for the body, mind and soul as the teachings and practices of Yoga have life changing effects on the quality of life of the participants.